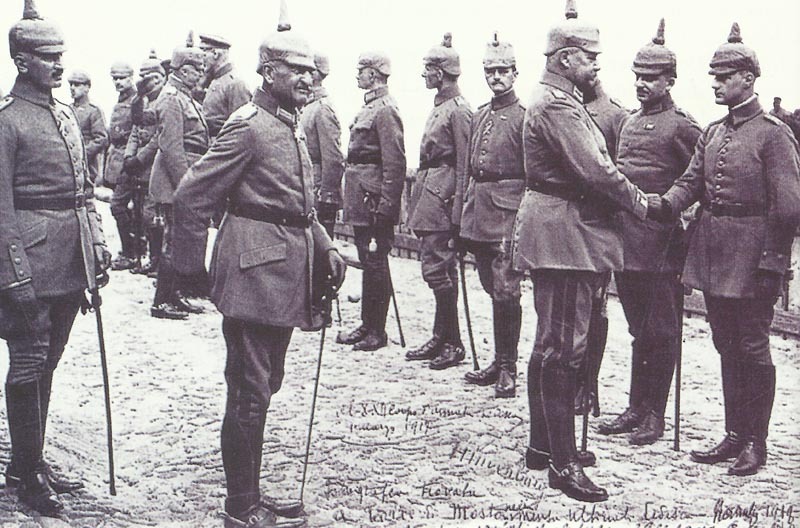 Hindenburg receives outstanding soldiers on the Eastern Front. Falkenhayn orders divisions from Mackensen to Danube despite Hindenburg and Ludendorff’s opposition; another 10 divisions follow later. Galicia­: Austrian ‘Black Yellow Offensive’ until September 12. Alsace: French storm trenches between Sondernach (foothold on crest since August 17) and Lardersbach. Julian Alps: Italians storm Mt Rombon and on August 30 also Mt. Maronia. Mesopotamia: Townshend returns to Amara after sick leave in India, ordered to advance on Kut. Firefly gunboat assemblage begun at Abadan. Adriatic: Italian CNS Revel warns Abruzzi to conserve ships, war likely to be long. Western Front – Argonne: French bomb Chatel rail station.